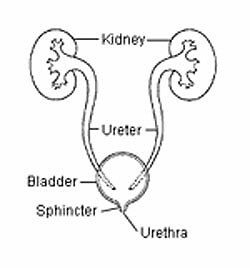 A Urinary Tract Infection, or UTI, is an infection in the urinary tract (the organs that hold urine). Different types of bacteria cause UTIs. VUR can cause UTI. VUR (vesico-ureteral reflux) is the backward flow of urine from the bladder into the ureter. Blockage of urine in the tract can cause a UTI. Bubble baths and strong soaps can irritate the urethra (opening where urine comes out) and lead to a UTI. Girls are more likely than boys to get UTIs. Boys and young children who get UTIs commonly have something wrong with the urinary tract. Young children who have unclean toilet habits are more likely to get UTIs. Boys who are not circumcised are at greater risk for getting UTIs than circumcised boys. Children who have problems emptying their bladders are more likely to get UTIs. Symptoms of a UTI are different depending on your child's age and where the infection is. Infections can either be in the lower tract or the upper tract. A lower tract infection is also called a bladder infection. Young children and infants may seem fussy, vomit, and have diarrhea. Young children with a UTI may not eat well or gain expected weight. Children might have a burning feeling when they urinate or urinate more often. Children might feel like they have to urinate more often but actually release very little urine. Although uncommon, children might wet their pants. The child may have low back pain, stomach pain below the navel, or a long-lasting fever. Urine might smell bad, be a cloudy or unusual color, or have blood in it. An upper tract infection could also be a kidney infection. Many of the symptoms are the same as for a lower tract infection. Your child might have a fever and chills. An upper UTI can cause pain on the side, below the ribs. Children who have an upper UTI may be tired, vomit, and look very ill.
No. UTIs are not contagious. Children with UTIs are usually treated as outpatients. In some cases, children may need to be hospitalized, especially if they are under 6 months old. The doctor will take a urine test (urinalysis, urine culture) to see if there is an infection. Give your child ALL the antibiotics the doctor prescribed, even if symptoms have improved. Make a follow-up appointment with the doctor to make sure the infection is gone. Your child might need to see a urologist. A urologist is a doctor who specializes in urinary infections. Symptoms should improve in 2 to 3 days following the first dose of antibiotics. Most UTIs get better in a week with the right treatment. If UTIs aren't treated, they could lead to serious kidney problems. UTIs can be prevented by taking a few simple precautions. School-age girls should avoid taking frequent bubble baths or using strong soap. Drinking lots of fluids can help prevent UTIs. Avoid giving your child caffeine, like soda and tea. It could irritate the bladder. After going to the bathroom, girls should wipe from the front of their body to the back. This keeps gut bacteria from spreading. Tell your child to go to the bathroom when she has to and not to hold it too long. Encourage your child to relax when she urinates so no urine is left in the bladder. When your child has bowel movements, it helps get rid of bacteria that can cause UTIs. Give your child stool softeners if needed. If your child has VUR, ask the doctor how to avoid future UTIs. Call the doctor if you think your child might have a UTI. Call the doctor if your child has a fever and chills, or pain with urination. Call the doctor if your child is dehydrated, vomiting, or can't take fluids or medicine by mouth. Call the doctor if your child has back pain. Call the doctor if your child has bad smelling, bloody, or strange colored urine. Call the doctor if your child has little appetite or is unusually fussy. A UTI is an infection in the urinary tract. UTIs can cause pain with urination, the need to urinate more often, fever, chills, vomiting, and pain in the back or side. One way UTIs can be prevented is by drinking plenty of fluids.